Correspondent's Criticism of Layout of Motoring Highway. By G. C. U. BROWN. The Warton Road viewed from Lytham St. Annes approach. The picture shows the cycle tracks and grass divisions. The section of main road now nearing completion between Lytham St. Armes and Preston provides an instructive example of one of the latest methods of road construction. This section, three-quarters of a mile long, comes immediately after leaving the boundary of Lytham St. Annes. Traffic here is exceptionally heavy all through the summer months and during the period of the annual Blackpool .Illuminations so that one would imagine that the chief object of spending a considerable amount of money on a new road would be to promote a safe and easy flow of traffic in both directions. There is no speed limit on this new stretch of highway. 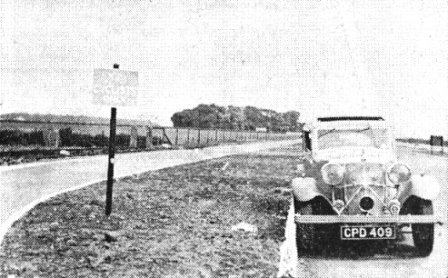 Inside the Borough of Lytham St. Armes, where the road is subject to the 30 m.p.h. limit, it is 36ft. in width, with an 8ft. footpath on each side of it—the total over-all width from hedge to hedge being 52 feet. For the new road no less than 80 feet over-all width from hedge to hedge has been utilised. Any experienced road-user would visualise two 24ft. roads divided by a 2 feet strip down the centre, two 6 feet cycle tracks, and two 4 feet footpaths, making in all full use of the excellent available 80 feet over-all width. Actually, unbelievable though it may be, what has been done is to provide one 24ft. road only (with cycle tracks and footpaths). The result is that motorists must not exceed 30 m.p.h. on the 36ft. road, and then they find themselves congested on the 24ft. road, which is supposed to be the last word in road construction. It does seem incredible that any responsible person could plan only a 24ft. road within an available width of 80ft., but it has been contrived thus: One 24ft. road, two 12ft. grass strips, two 8ft. cycle tracks, two 3ft. grass strips, and two 5ft. footpaths. The photograph shows the beginning of this new road. A width of 24ft. is inadequate for any busy main road of to-day, and it is to be hoped that those in authority will realise that fact before it is too late.